EXTRA measures are being taken to protect pets after a dog was seriously injured plunging into an old quarry at a Wigan beauty spot. Patricia and David Hart of Winstanley have issued a number of appeals to place safety measures at a disused Haigh Hall excavation after their short-haired German pointer, Daisy, suffered life-threatening injuries from a fall there. The couple were walking Daisy and their other pointer Bella near the Plantation Gates end of the country park when the two-year-old “fell off the face of the earth”. Patricia, 54, said: “She just completely disappeared off the side and all we heard were some unmerciful screams. It was awful, I was terrified. “We looked over the side and it was this huge, unused quarry, but there had been no signs or fencing or anything - you would have no idea it ever existed. Dave went down to rescue her but I was beside myself. I thought if he fell he could kill himself as it’s just a sheer drop. Daisy suffered multiple injuries including a broken leg and numerous cuts. Patricia and Dave took her to an emergency vets where she underwent an operation and had to be treated for wounds which were bandaged every five days for a month afterwards. Patricia added: “She will never be the same again and still can’t walk properly. We were so upset at the time and I just keep thinking if my two grandsons had been there they could have also fallen in. 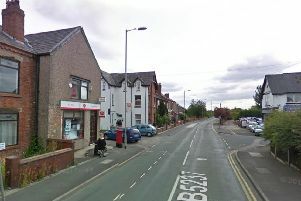 Since the incident, council officials have assured the couple that more action will be taken to protect residents and pets from a similar fate. Paul Barton, head of Greenspace and infrastructure at Wigan Council, said: “We have been made aware of this unfortunate incident. “This does appear to be an isolated occurrence as we have no other reports on file of any similar incidents at this site.